This has become the common answer to how an American stays informed in this age of blatant pandering and misinformation. What should be shocking to anyone who can stand back and remember the honor bound public service that was originally envisioned, is that the obvious bias has become so pronounced and common place that it is now an accepted part of the process. Many would argue that media in this country has never lived up to those grandiose idealistic pillars of impartiality and morality that were originally visualized, and that may indeed be the case. Yet, that does not change the fact that these individuals were given a mandate of which they have failed to live up to, and likely never even feigned an attempt at success once the true value was recognized in the ability to sell their interests to the highest bidding corporate sponsor or political agenda. The simple concept that a viewer has two politically charged options on television, of which both are openly and fiercely bias to their sponsor’s interests, and that a viewer can then watch both these compromised sides and walk away fully informed, is this country’s biggest misconception. Deep down, most already know this to be a false security, yet do not want to admit it to themselves for fear that the admission would then cast doubt on their entire lifetime of commitment and acceptance of this broken system. Most continue to participate in this façade because they are falsely led to believe that there are no other options; that this system is the pinnacle of thousands of years of development building toward a better system of democracy. Well sadly, that is not the case. This country has not been a democracy for a very long time, and that fact has become quite a bit more pronounced in recent years with the rise of the police state, the infiltration of the medical industry, the continual erosion of every American’s constitutional rights, and the defrauding of the election process. Government by the people; a form of government in which the supreme power is vested in the people and exercised directly by them or by their elected agents under a free electoral system. A form of government in which all power is vested in a few persons or in a dominant class or clique; government by the few. Even to a child, it is quite clear which of these two are being practiced in the US. 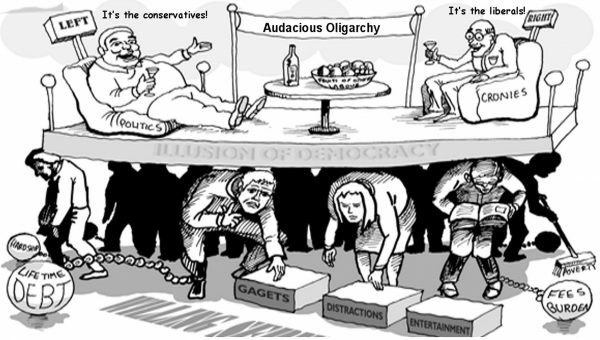 All one must do is take a look at the non-existent middle class to see that this country is being ruled by an élite run oligarchy; or at the very least, a plutocracy or corporatocracy, both of which more accurately represent what Americans are experiencing in this country. The U.S. government now represents the rich and powerful, not the average citizen. In the study, “Testing Theories of American Politics: Elites, Interest Groups and Average Citizens,” researchers compared 1,800 different US policies that were put in place by politicians between 1981 and 2002 to the type of policies preferred by the average and wealthy American, or special interest groups. Researchers then concluded that US policies are formed more by special interest groups than by politicians properly representing the will of the general people, including the lower-income class. “The central point that emerges from our research is that economic elites and organized groups representing business interests have substantial independent impacts on U.S. government policy, while mass-based interest groups and average citizens have little or no independent influence,” the study found. Many forget that this nation was originally founded as a republic, which was supposed to give all the power to the people themselves. If one chooses to over look the rampant voter fraud that took place this past election, the disproportionate allotment of super-delegates following the primaries, redistricting or gerrymandering, and the inherent undemocratic process of the electoral college, then a republic has a way of appearing like this country’s style of government. Yet once these are all taken into account, a state in which “supreme power” rests in the hands of a the citizens, does not seem anything like what is seen today. A state in which the supreme power rests in the body of citizens entitled to vote and is exercised by representatives chosen directly or indirectly by them. One can clearly see that this form of government–the form which the nation’s founding fathers set forth to protect the future of American liberty–was originally chosen as the best way to ensure the rights of Americans. As one can clearly see, a republic is not only far from what Americans experience, but quite possibly was never practiced outside of the few idealistic moral bound men who led the charge to American freedom. History has shown that those men were the minority in that historical room, yet they were the dominate voice. Since that time, that voice has faded, and a more sinister and profiteering voice has risen to fill its place.